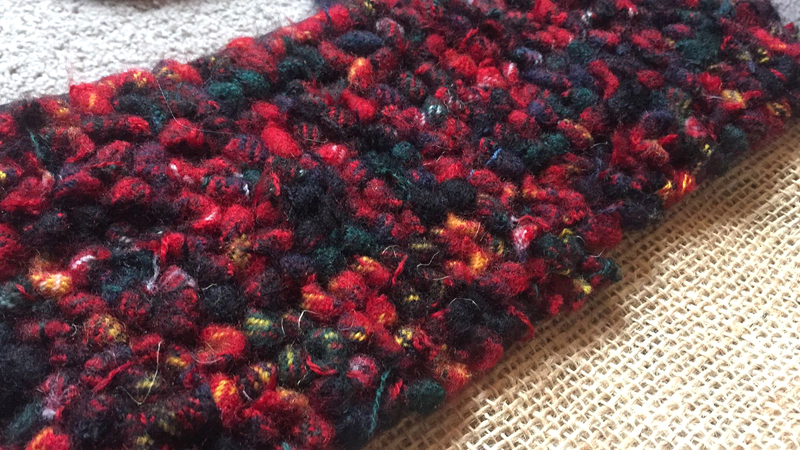 I was so pleased with how the blanket yarn looked when it was loopy rag rugged. I was surprised by what an intricate pattern the blanket yarn created. This was a plaid yarn. 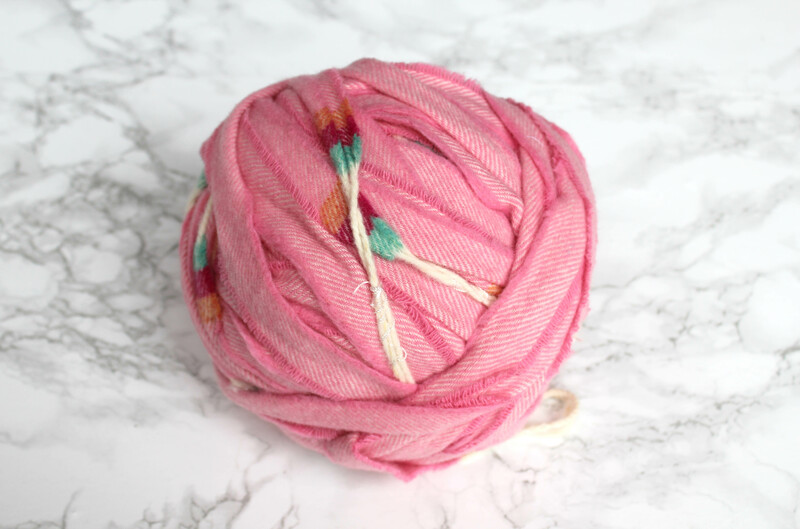 So, what makes this Blanket Yarn so great? 1) It’s 100% wool, so it’s not only super soft, but also excellent quality. 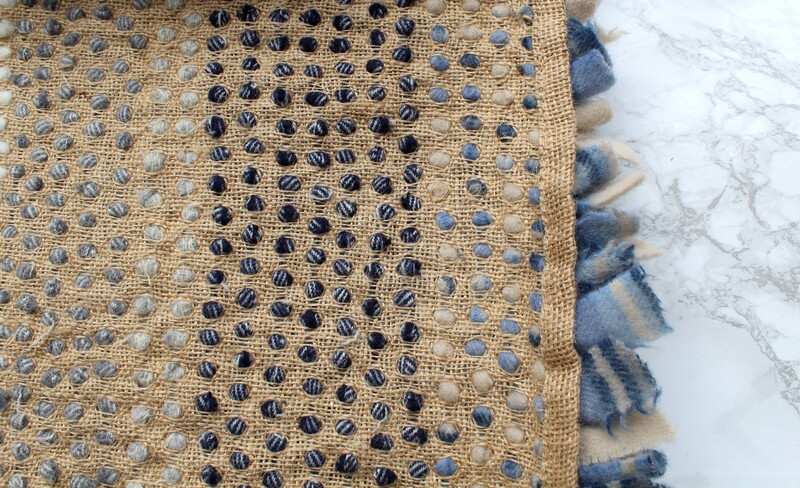 It’s an absolute pleasure to work with, and any rug or cushion made in blanket yarn will last for generations. 4) It’s sustainable. Our blanket yarn is made from offcuts from blanket production in Yorkshire, so you can rest assured that every ball you use is recycling. So, where can I buy it and what’s the deal? 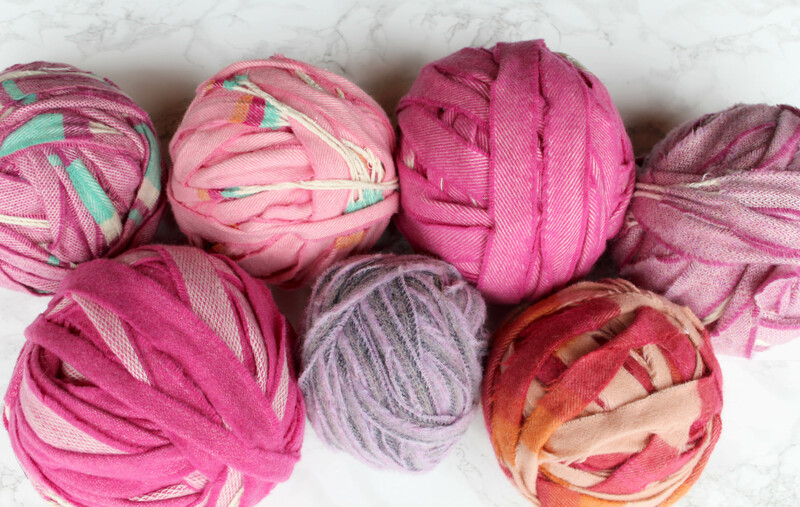 I’ve listed the new blanket yarn on the Ragged Life Shop but, as it’s pretty much pot-luck what colours I’m sent through from the mill, I’ve listed it to be bought in 500g or 1kg lots based on colour – Pinks, Blues, Greens, Neutrals or Mixed. When you order 500g or 1kg of blanket yarn, you will get a random selection of complementary shades, but if you particularly like any of the specific blanket yarns in the photos, you can write the individual names down when you check out and we will endeavour to take your preferences into consideration. Unfortunately, we won’t be able to do this all the time as we have a very limited number of each and cannot guarantee availability. 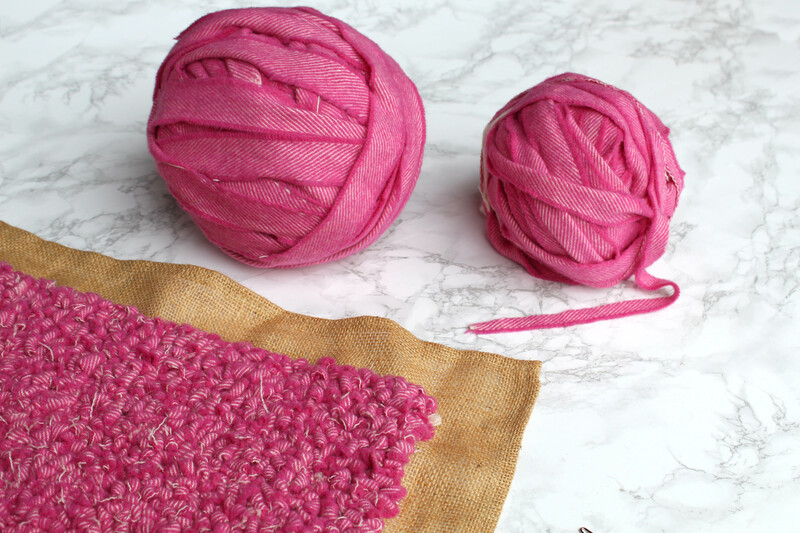 We have a number of different hanks of pretty pink blanket yarn. 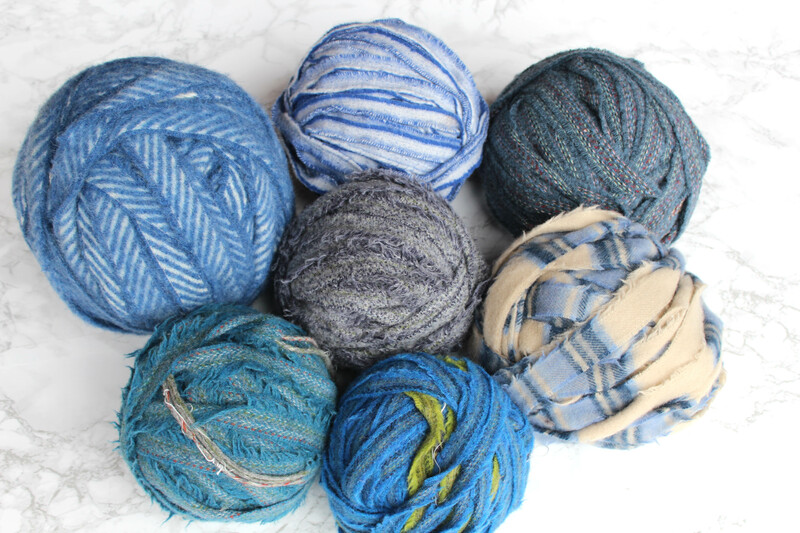 We got through some gorgeous blue blanket yarns. 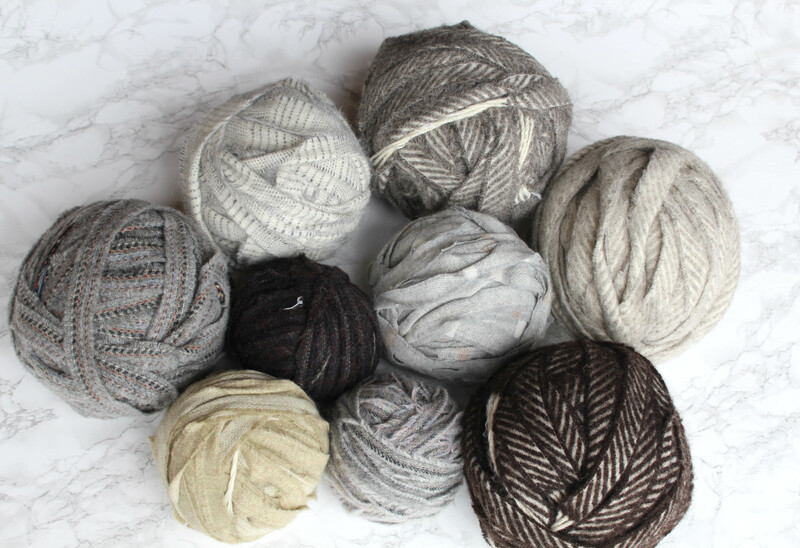 I’m totally on board with the Scandi chic look as most of you know and these blanket yarns would look gorgeous together in any rag rug project. I got through some gorgeous bits of multicoloured blanket yarn. 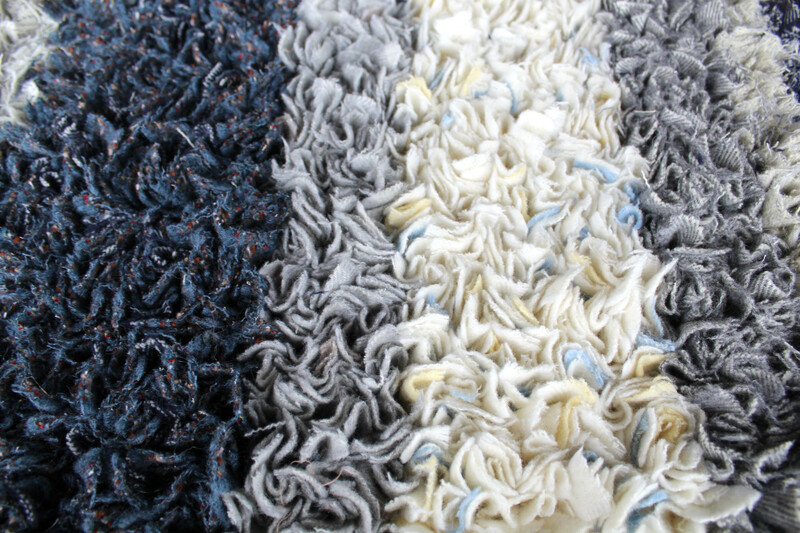 Can I do both the loopy and shaggy rag rug techniques with this blanket yarn? Here you can see what the rag rugging looks like when it’s work in progress. 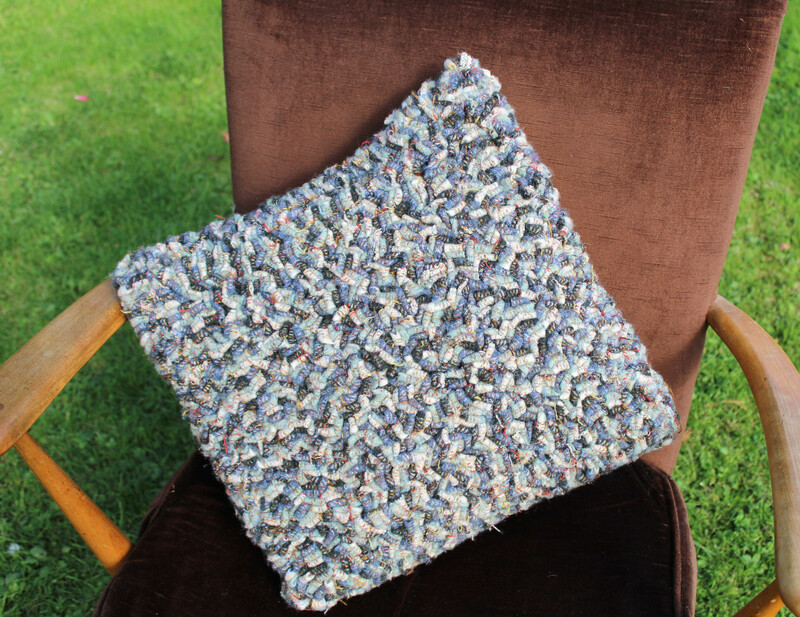 Here you can see what it looks like when the entire cushion front is rag rugged in one tartan ball of blanket yarn. Here you can see what the rug looked like when it was only partially rag rugged. 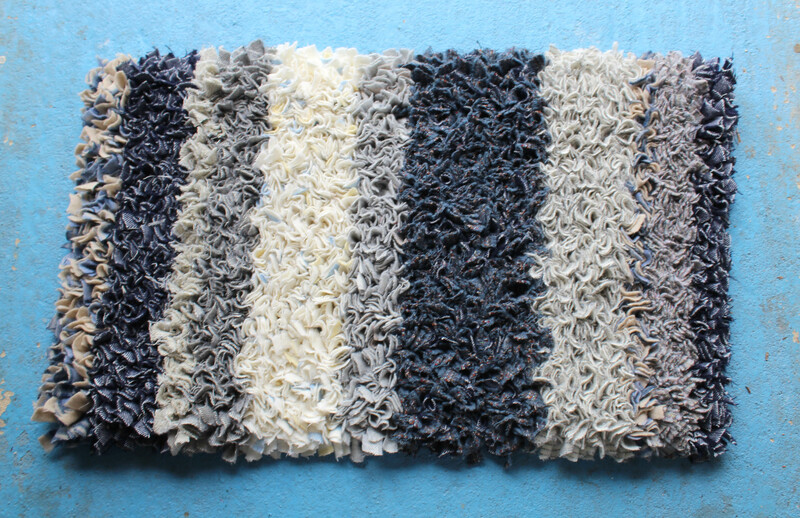 This is the first shaggy rag rug we’ve every made in our lovely blanket yarn. We were so pleased with how it turned out and how quickly it built up! Blanket yarn has such a warm, cosy feel to it. 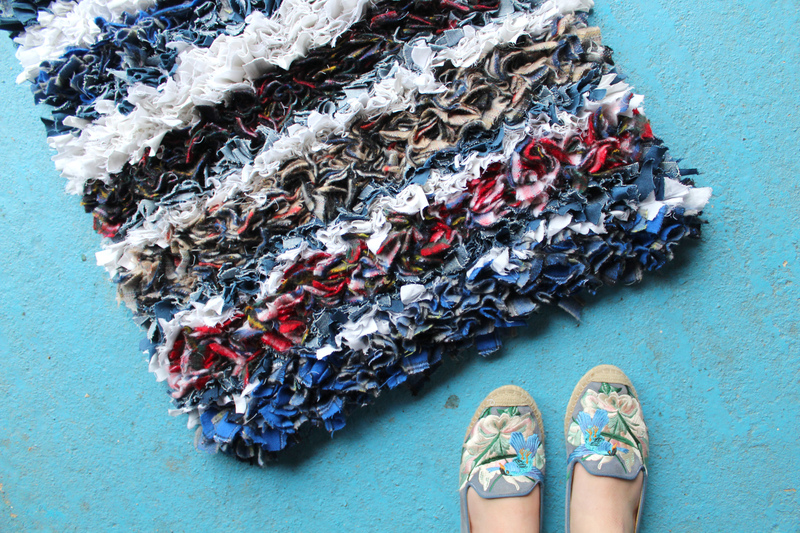 And below is a rug that my mum, Victoria, made using a mixture of blanket yarn and other materials. 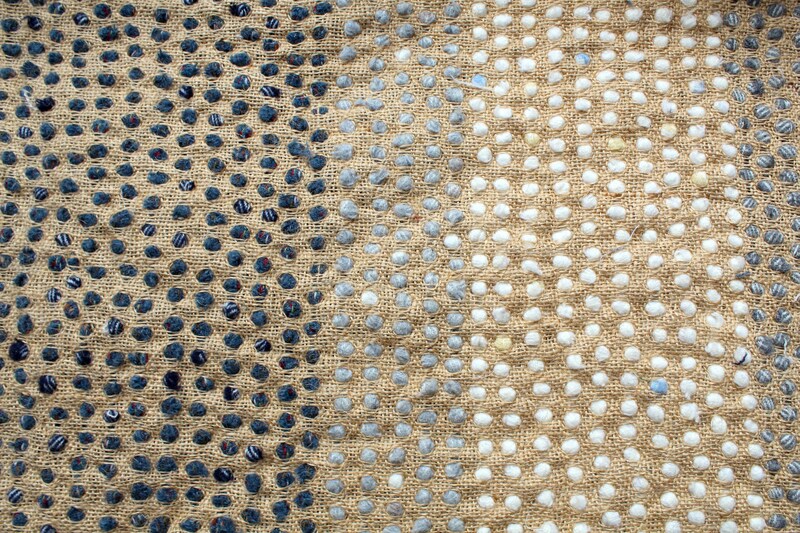 You can see more photos on the rug specific blog post here. 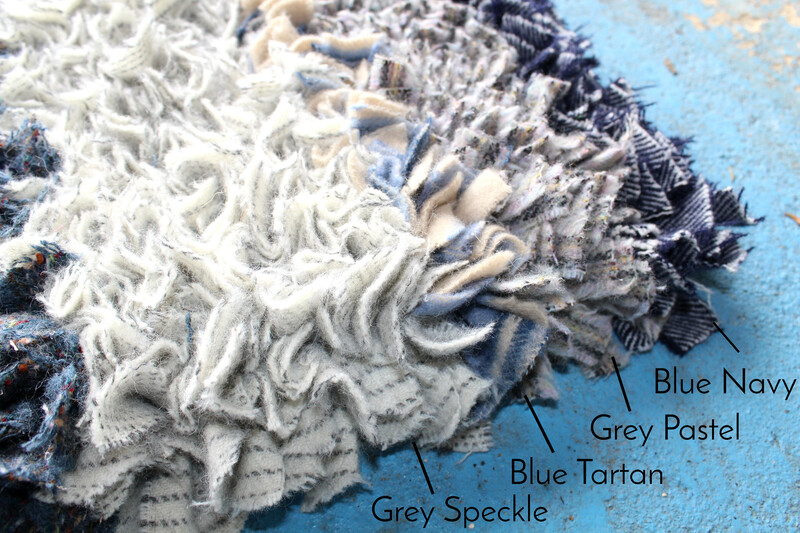 And below is another blended blanket yarn rag rug made using a mixture of tartan blanket yarn, denim and shirts… You can see more photos and read a bit more about the rug below here. Are the rag rugging techniques different when you use blanket yarn? 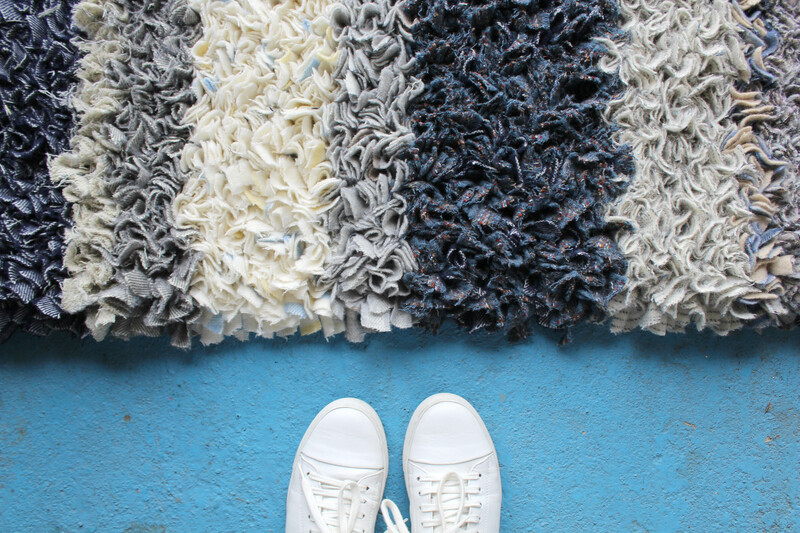 This blanket yarn rug took 64 rows of shaggy rag rugging to complete. It’s a little difficult to count the rows in this rug but when I finally managed (third try! 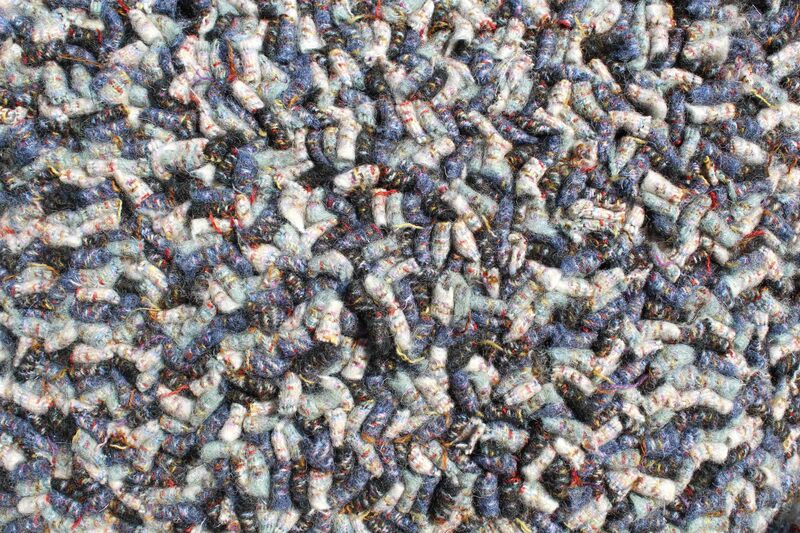 ), I counted 87 rows, which is a lot denser than the blanket yarn rug. 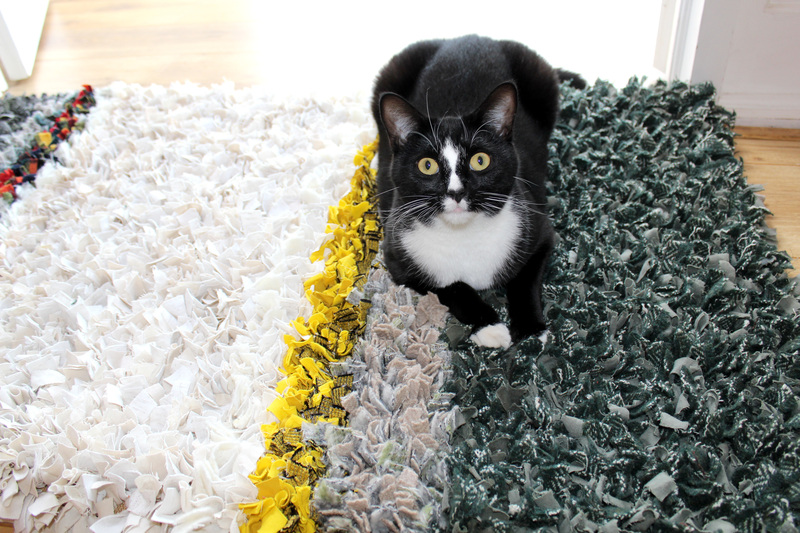 With blanket yarn, you have to space your strips further apart to prevent the rug from curling when it is finished. 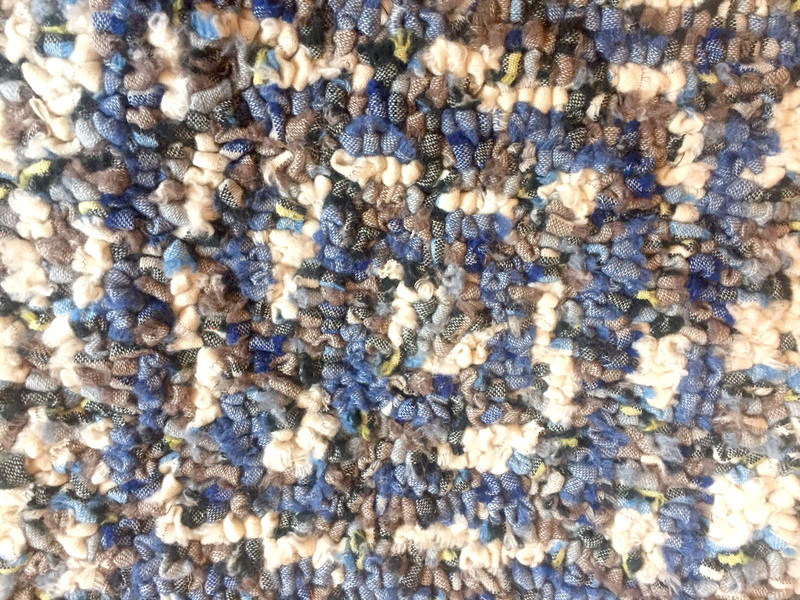 Although the spacing varies a bit across the rug, it is reasonably consistent. 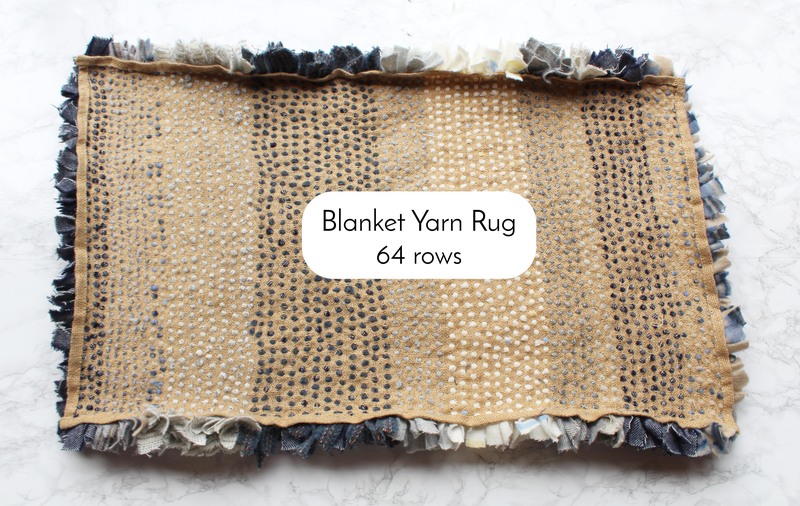 How much blanket yarn do I need to make a cushion/ rug? 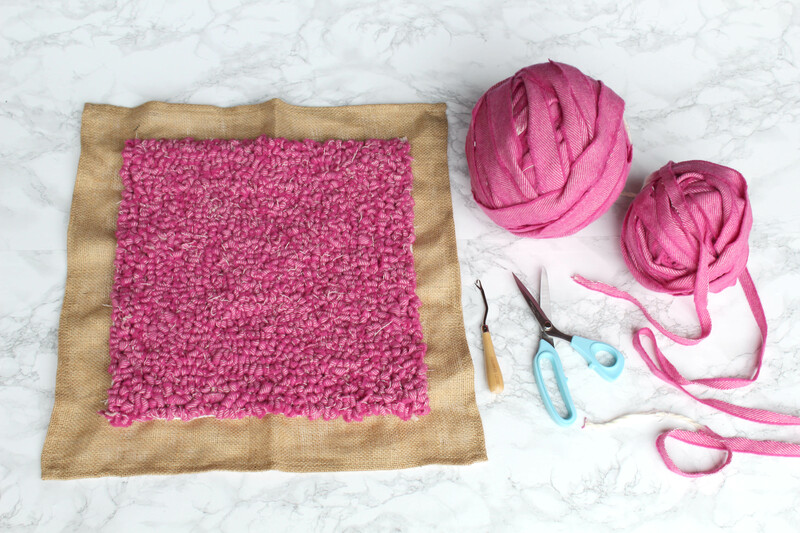 This 40x40cm cushion cover took 312g of blanket yarn when done in the loopy technique… This was done in one particular pink “Pink Magenta” but you could use a variety of shades to make a more interesting design. 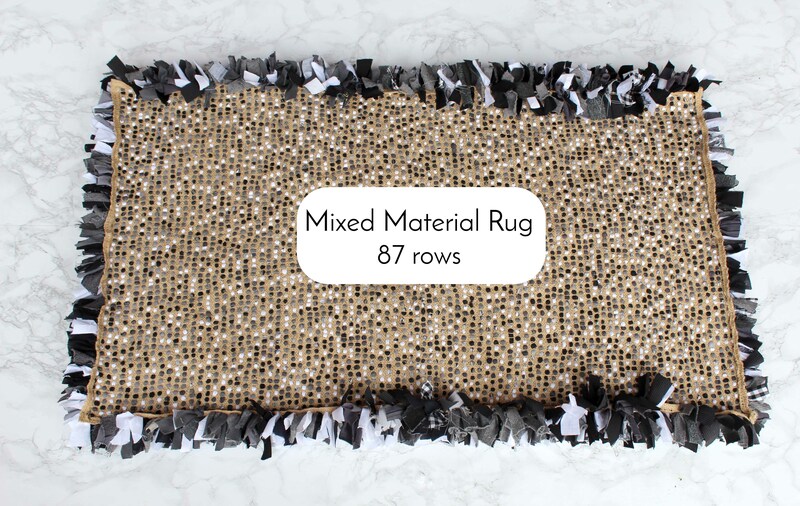 Based on those numbers, it would take approximately 1,170 grams (1.17kg) of blanket yarn to cover one of our standard 100 x 60cm rugs hessian in loopy rag rugging. 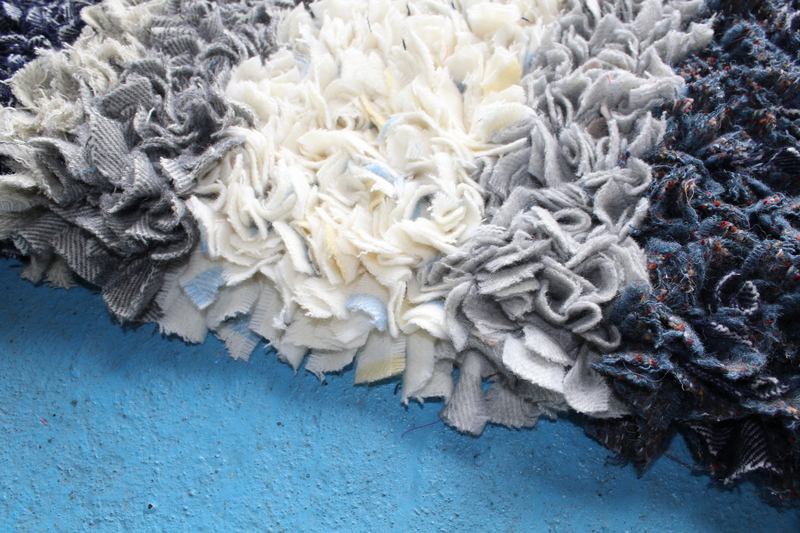 Our first standard sized 100 x 60cm shaggy rag rug took 2.3kg of blanket yarn to make. Here you can see exactly what each different blanket yarn looked when it was rag rugged. Here you can see the far end of the rug. 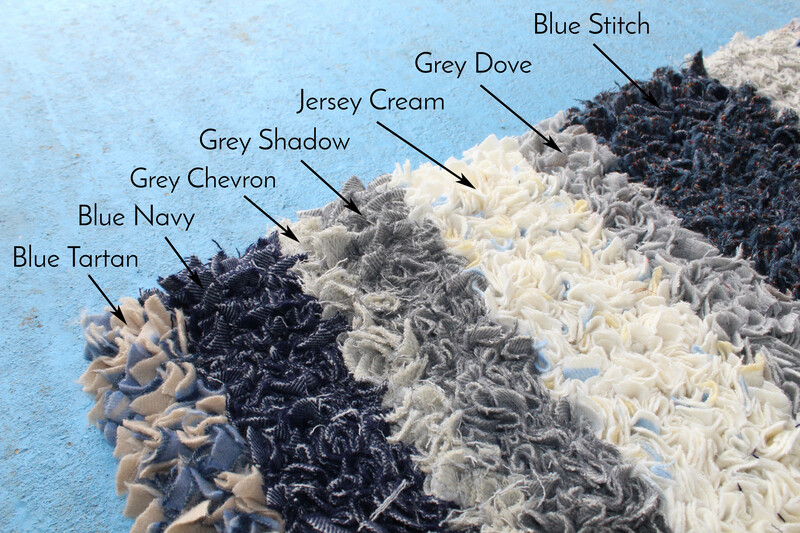 These were the ingredients that went into making our first blanket yarn shaggy rag rug. 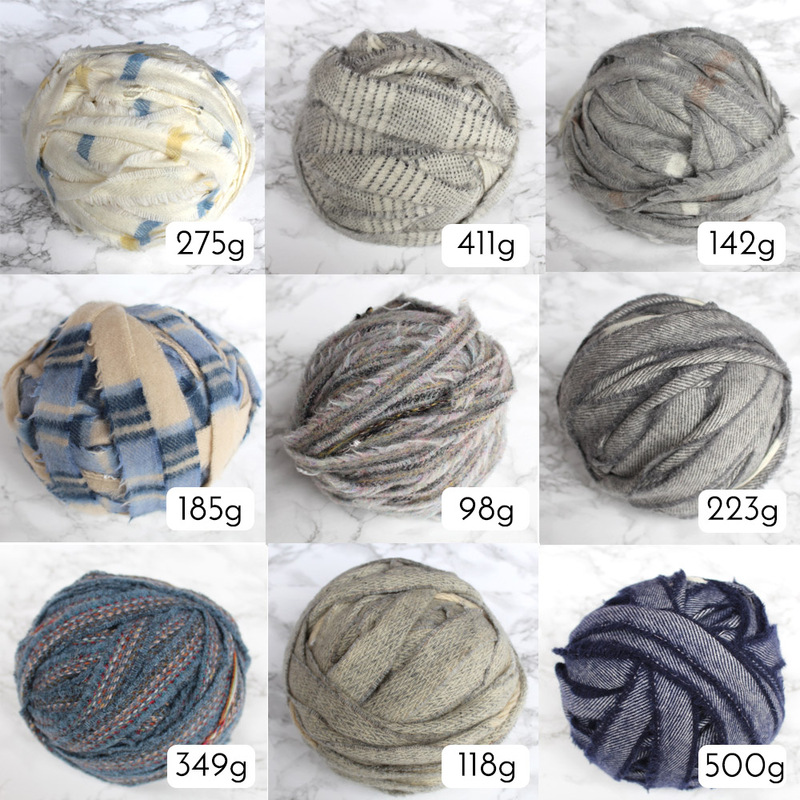 Based on those numbers, it would take approximately 614 grams of blanket yarn to cover one of our standard 40 x 40cm cushion hessian in shaggy rag rugging (although this is just an estimate until we can make one for the first time). Can I start rag rugging straight away or is there anything I have to do with the blanket yarn first to prepare? 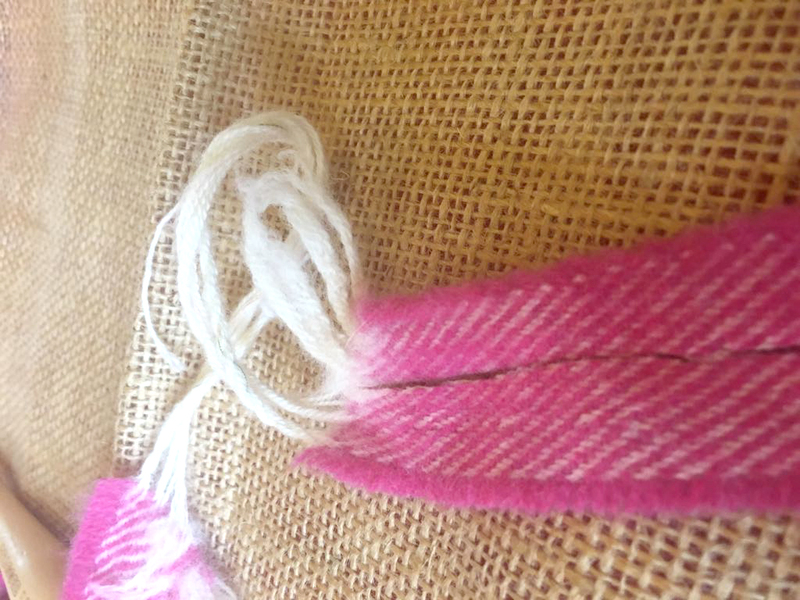 Here you can see that we cut the strips of the ball on the right in half lengthways to make them narrower and easier to rag rug with to make our pink cushion cover. Although most of the blanket yarns will have strips that are a bit too wide, some are the perfect width like this one here. 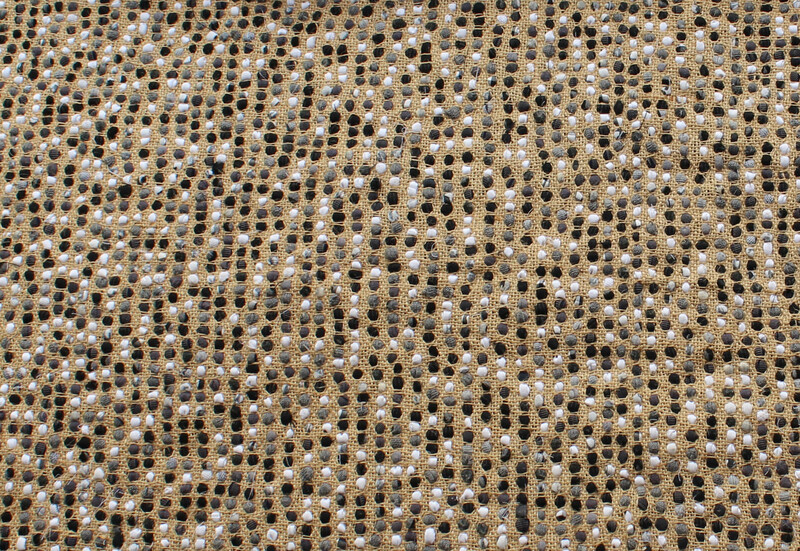 As blanket yarn is made from the offcuts of blanket production, there are woollen strands that join the woollen strips of fabric together (you can see the strands in the photo below). These strands occur roughly every 120cm along each strip of blanket yarn. At first, I used to cut them out as I went along, but now I actually incorporate them into my designs, so it’s down to personal preference whether you use them or not. Here you can see the aforementioned strands in the centre of the ball of blanket yarn. These occur roughly every 120cm. Here you can see the strands a bit better. 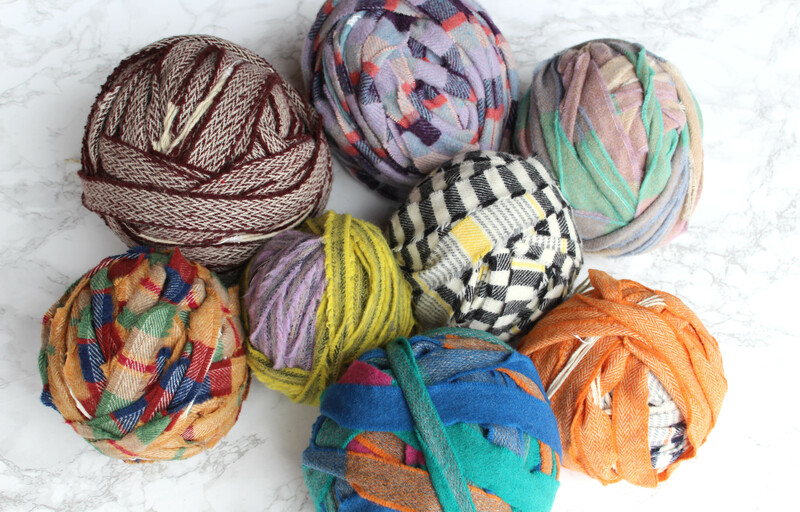 If I buy a ball of blanket yarn which has patches of other colour in it, will I be able to see the different colours when I start rag rugging? 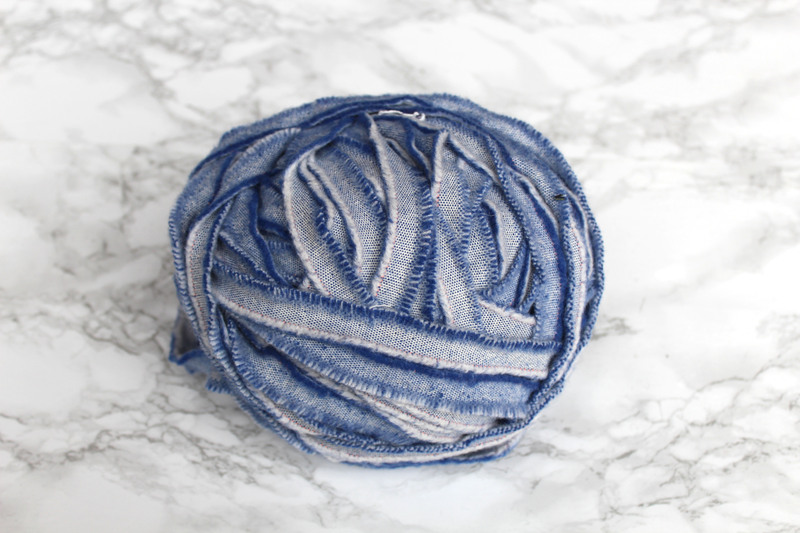 One of the nicest things about blanket yarn is that you don’t need to do anything intricate design-wise because the patterns within the yarn do a lot of the work for you. 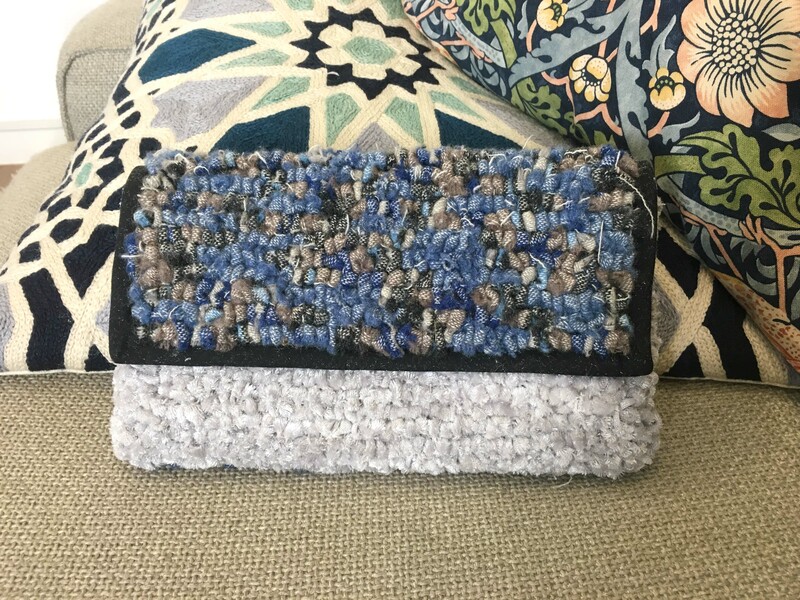 Both of the below clutch bags were rag rugged using tartan fabric yarn, for example, and you can see how they become a blend of the different colours in the plaid. 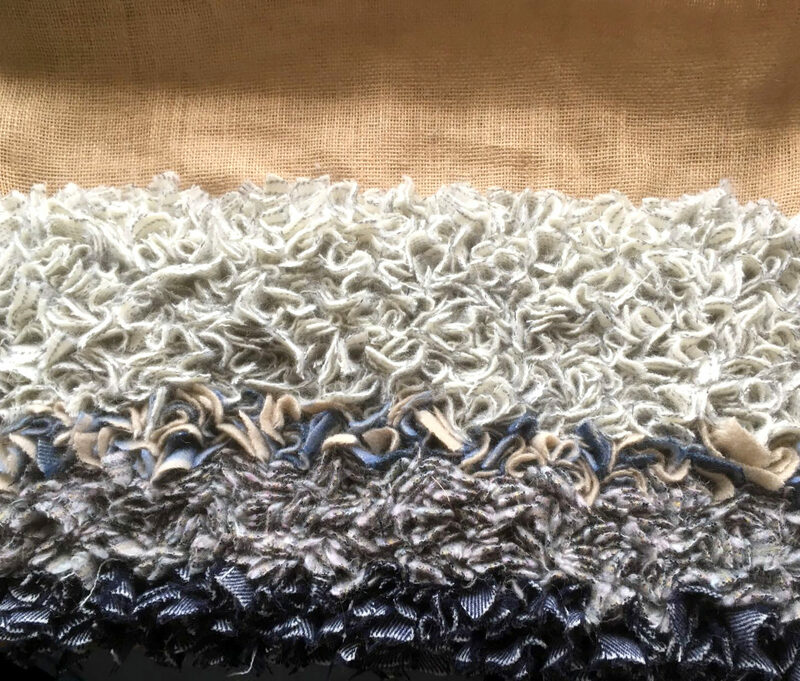 This variation in colour means that you can rag rug a cushion cover or rug entirely in one fabric if you want to and it will look interesting and complex. 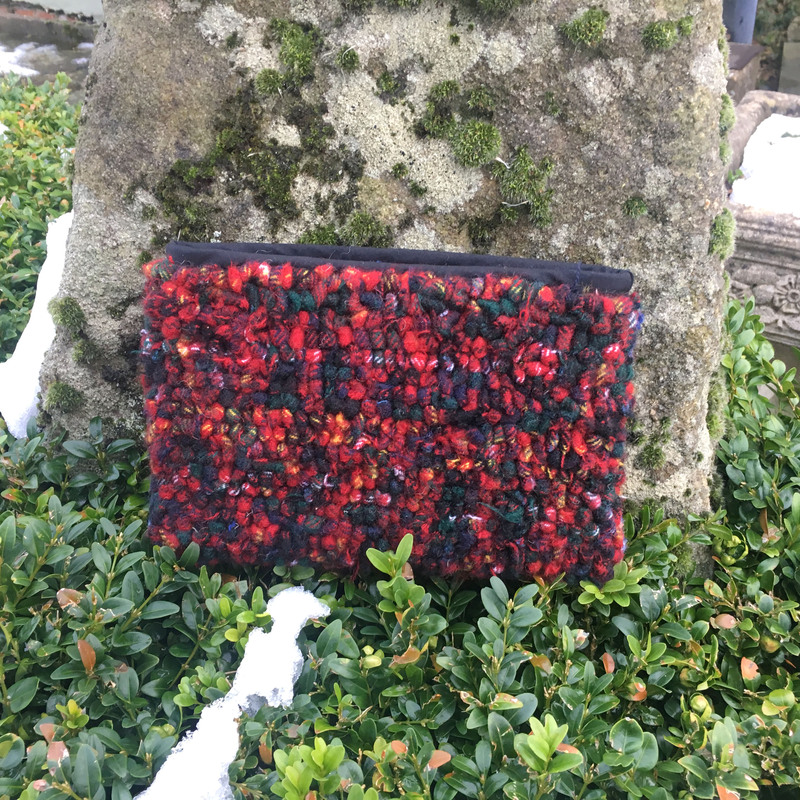 This side of the clutch bag was rag rugged entirely in one red, green and yellow tartan. Here you can see up close what the loopy rag rugging looks like. And the other side of the bag was done in a simple blue blanket yarn. I love how the little specks of white show through. 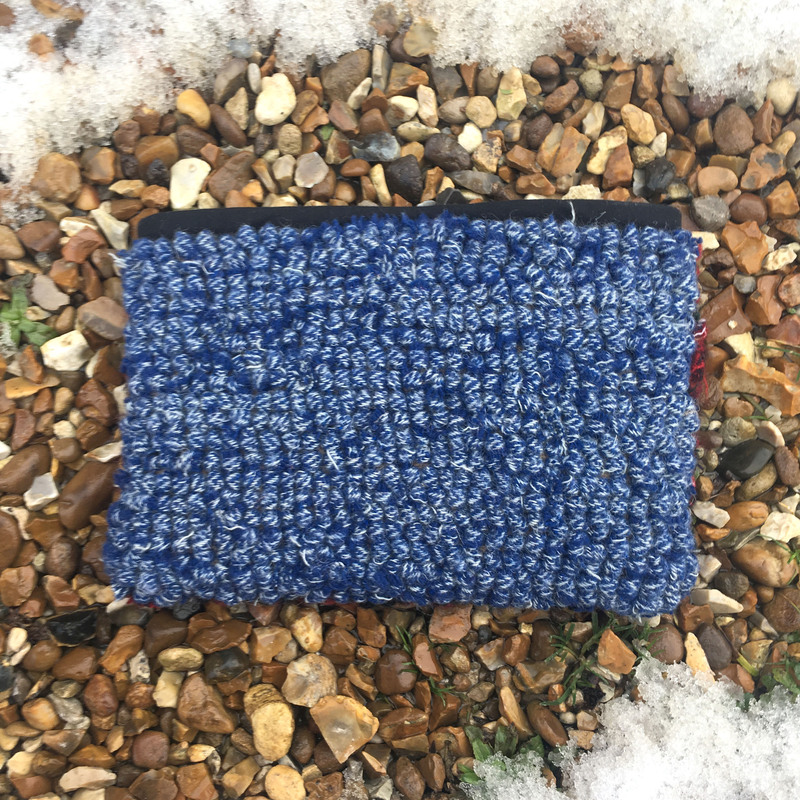 The flap of this clutch bag was done in a yarn which had a mixture of blue, brown and black in it. Do you think the quality will be better/ will my cushion/ rug… last better using this instead of using old clothing or other fabrics? Absolutely! 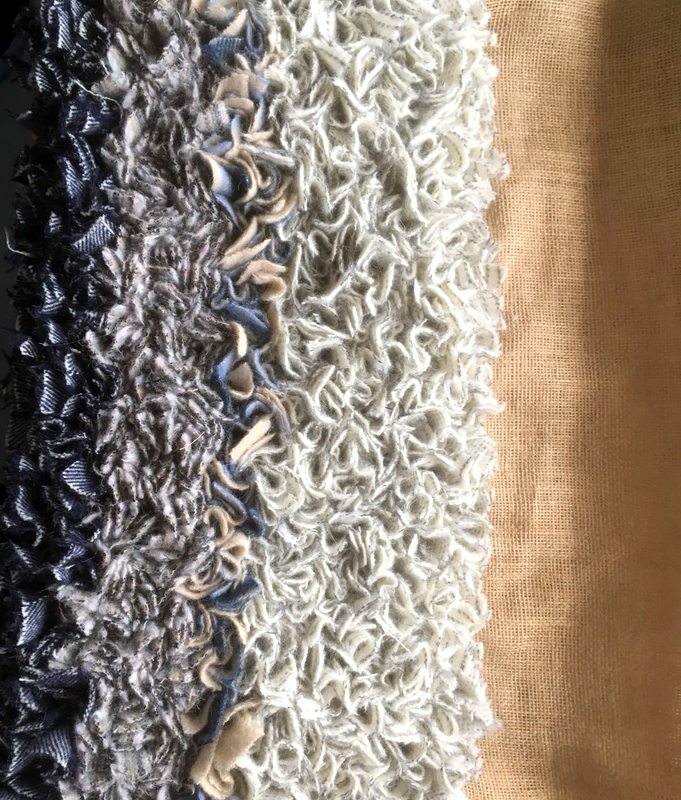 Even though I use absolutely any fabrics in my rag rug projects (yes, I truly mean anything), there’s no doubt in my mind that the better the quality of fabrics that you put in a rug, the longer it is likely to last. 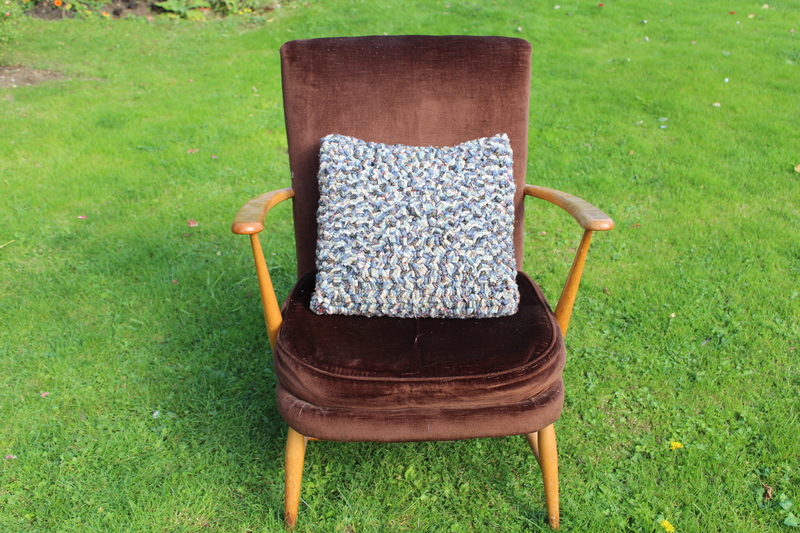 As all of our blanket yarns are 100% wool, they’ll be extremely hard-wearing in a rug or cushion. Is the finish different to using clothing/ other fabrics? 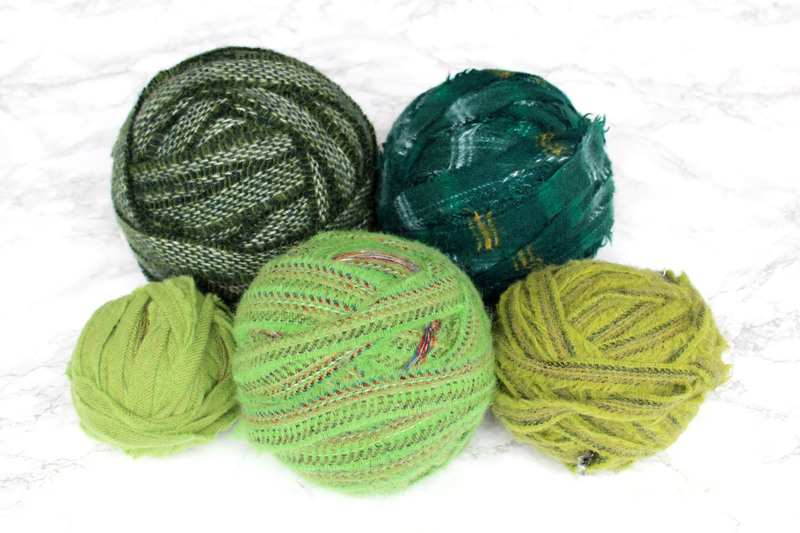 Do you recommend rag rugging projects with blanket yarn? E.g. if I wanted to make a basket trim or flower rather than a cushion or rug? 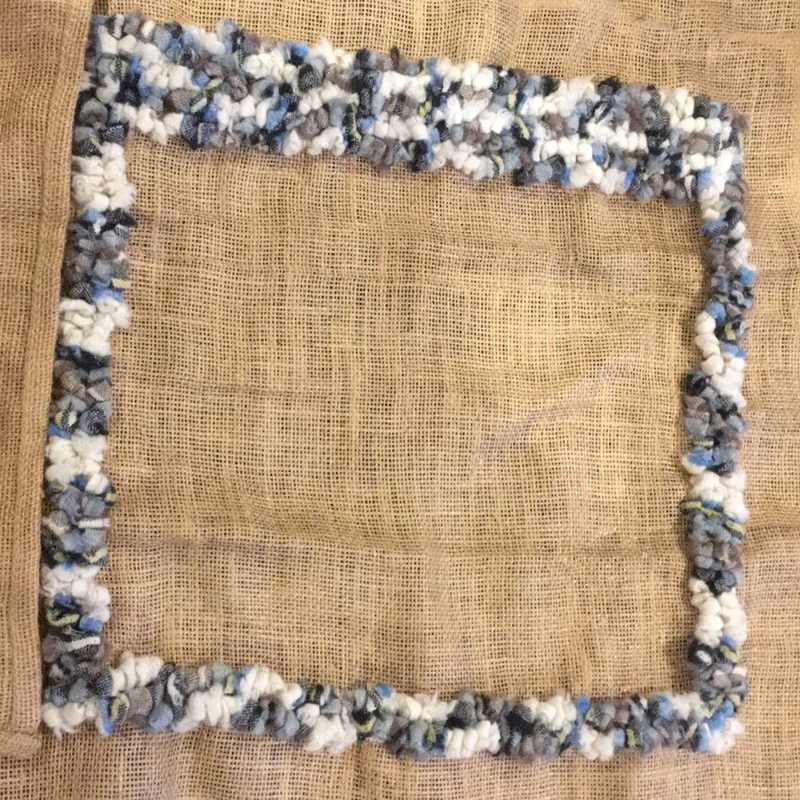 There’s no reason why you couldn’t use blanket yarn for absolutely any rag rug project, but design-wise I think it looks best in larger projects (wreath size and upwards). It’s hard to be dainty with blanket yarn (as it’s so thick and cosy), so it would be difficult to create a light floaty look with it. I wouldn’t necessarily recommend blanket yarn for the rag rug bouquets and rag rug basket trims, for example. 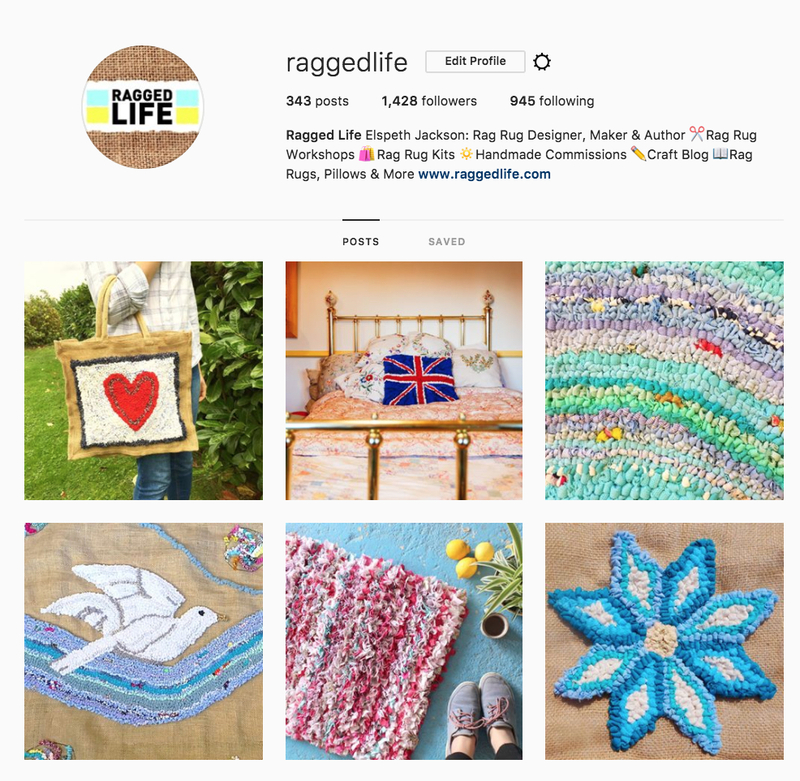 This entry was posted in Rag Rug Fabrics, Rag Rug Supplies and tagged 2018, Blanket Yarn, Décor, Fabrics, Loopy Rag Rugs, Multicoloured, Planning a Rag Rug, Rag Rug Cushions, Shaggy. Bookmark the permalink.